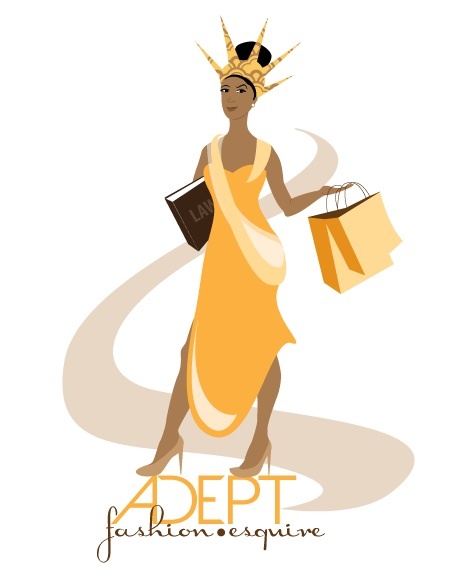 The Fashion Law Society at John Marshall Law School in Chicago is at it again. After putting on their 2nd Annual Fashion Law Symposium this past Spring, they are once again making their mark in the Windy City fashion industry. This seminar is sure to be a necessity for designers--and a fun networking opportunity, too. Check it out! Starting a business in the fashion industry? Are you a designer or wishing to open a retail shop or both? What rights do you have to your designs? What protections do you need as a business owner of a retail shop? It is more than a creative vision. Assortments of legal issues come in every size and in a variety of different colors. From structuring your company, agreements with buyers even registering the related Trademarks. There are numerous legal considerations someone interested in starting a business in the fashion industry should take. Understanding these legal considerations will allow you to plan for the future and structure and strengthen your business in a way that will help you to succeed. 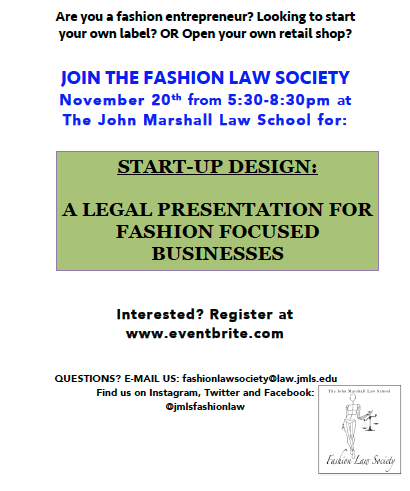 Join the John Marshall Fashion Law Society for ‘Design Business’ on November 20th at 5:30 at the John Marshall Law School. The event will feature presentation from the John Marshall Trademark Clinic and Patent Clinic regarding Intellectual Property issues as they relate to design, as well as a presentation from the Business Enterprise Law Clinic regarding business entities and essential agreements for business dealings within the industry. After the presentations there will be an opportunity to participate in client intake interviews with the legal clinics at possibly get your legal concerns handled. The event will equip you with the knowledge you need to take your business to the next step. Please join us and lets talk business! Wow! This is a very useful page and I really enjoyed reading article and all users’ comments. Rocked Out Silver is a Fashion Driven, Music inspired company. We specialize in creating the best quality Fashion Jewelry at the best prices for our customers. Here you can shop- Rocked Out Silver, Custom Silver Belt Buckles & Fashion Jewelry, Men's Fashion Jewelry, Shop Rocked Out Silver, Dog Tags, Custom Silver Belt Buckles and Men's Fashion Jewelry, Fashion Driven, Music Inspired company, Custom handmade silver belt buckles etc. Thank you for sharing valuable information.